Unlike the name suggests, horse blinders, also known as blinkers or winkers, do not blind horses. Horse blinders are firm leather squares or plastic cups that attach to a horse's bridle or hood and prevent a horse from seeing behind and beside him. Horses that pull wagons and carriages wear blinkers to prevent them from becoming distracted or panicked by what they see behind the wagon. Horses are prey animals and have peripheral vision. A horse's eyes are located on the sides of his head, allowing him to see a panoramic view of the world. In fact, horses can see a nearly full circle around themselves except for a small blind spot in front of their noses and behind their tails. Blinders cover the rear and side vision of the horse, forcing him to focus only in a forward direction. The reduction in vision for horses wearing blinders is significant and can reduce a horse's vision from 180 degrees to as little as 30 degrees, depending on the size and depth of the blinders. When harness horses are first trained to pull wagons and carriages, they wear blinders to keep them from being distracted by the vehicle they are pulling. 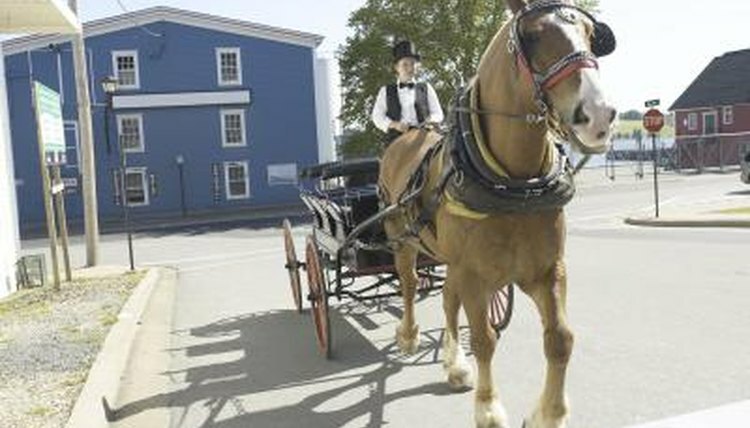 After they are trained to pull a wagon, cart or carriage, some horses continue to wear blinkers to prevent distraction from traffic or crowds. Some horse trainers also insist on using blinkers to dissuade horses from backing up while in harness -- which can be dangerous for the horse and passersby. Similar to harness horses, racehorses often wear hoods with blinders to keep them focused on the racetrack and avoid distraction at the starting gate and from other racehorses. Some racehorse trainers also use blinders to make a horse start and run faster by making him believe he is further behind the pack than he actually is. During World War I, horses were essential to transportation of weapons and cavalry units. Horses used during battle often wore blinkers to block out distractions like artillery and approaching armies form their view. Park Lane Equestrian: Why Do Horses Wear Blinders?